Three post defense concepts – walling up, choking the post and post traps – from the Pack Line defense. The focal point of post defense within Pack Line principles is to limit deep catches. 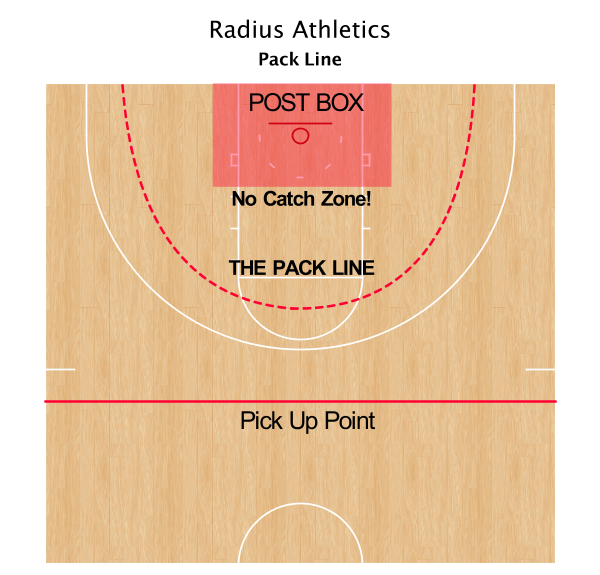 Pack Line teams want to keep the ball out of the “Post Box” altogether (see diagram below). When the ball does enter the Post Box there is a singular mission – get it out. Defending the Post Box and playing post defense in the Pack Line system requires effort and physicality. It also requires help from perimeter defenders as well as the execution of three Pack Line fundamental concepts – walling up, “choking” the post and post traps. 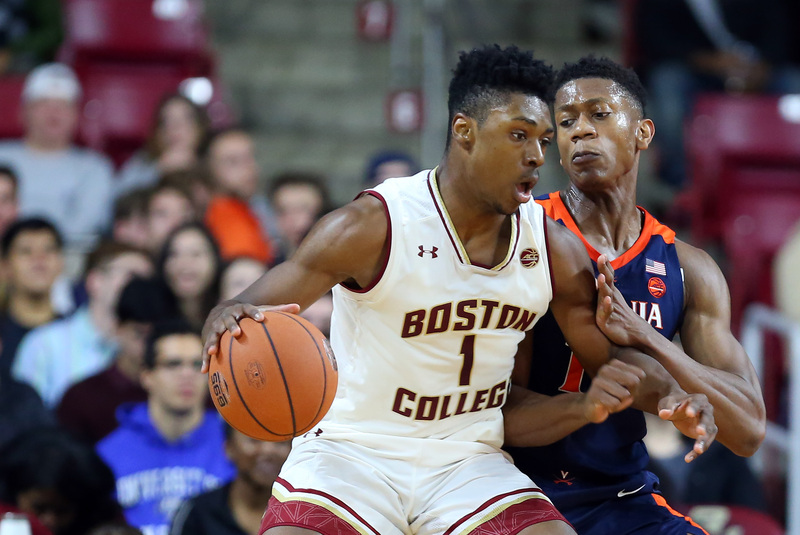 We’ll take a look at these with the help of the Pack Line archetype Virginia Cavaliers. Play in a 3/4 front position when guarding the post with the ball on the wing. Again, the mission is to keep the ball out of the Post Box. The defense shall allow no post feeds from the top. Do not gamble for steals or make yourself too vulnerable to lobs, but have an arm in the passing lane to deter entry. Get hands up and chest out. Brace for contact and move your feet. Virginia calls this becoming a “wall on wheels.” Keep feet moving and arms up to stay between the ball and basket. Effective post defense in the Pack Line requires team effort from the post and perimeter players. Guards too play a role in post defense. First, guards apply suffocating ball pressure so as to disrupt the passer from entering the post. Get their eyes down on you and disrupt sight lines by being dogged on the ball. Second, when the ball does enter the post strong-side guards reduce the space the post has to operate by “choking” the post. In choking the post, the strong-side guard stunts at the post once he/she receives the post entry. Stunt while the post has a live dribble. Once the post puts the ball on the floor, the strong-side guard helps “dig” it out. Use a “hard dig” when you are guarding a non-shooter and a “short dig” when you are guarding a shooting threat. There is a fine line here as the defense wants to disallow a direct pass back out to the feeder from the post. Stunt only so far as to not present an easy catch-and-shoot three for the feeder. This is personnel driven. With a great shooter on the strong-side there may be no choke at all. An aggressive option in the Pack Line post defense package is the post trap. This is an all out assault on the ball when it enters the Post Box. There are two parts to an effective post trap. First, the on-ball post defender must pop behind and disallow the baseline turn. Second, the “trapper” comes hard with hands high looking to deflect any pass out. Tighten the trap forming a 90º angle with the original post defender. Do not foul on the trap! The three players outside the trap follow these guidelines. The strong-side guard must deny the feeder. The weakside defenders must cover rim and nail and take any cutters coming to those areas. Pack Line teams must treat all threats to the Post Box as an emergency. Walling up, choking and trapping the post are ways Pack Line defenses protect and defend this vital real estate. For help with practice planning and implementation of a Pack Line or Pressure Man man-to-man defense, join our community of basketball coaches! Follow #PackLine on Twitter! Any questions: Contact me. Happy to talk hoops any time day or night! Sign up here for our twice-monthly newsletter.